It is October 3, 2011. October! That means it's time for apple picking, trick-o-treating, and a little piece of heaven I like to call... pumpkin season. As my loyal followers know, I was on quite the pumpkin spree last year. Pumpkin Pie Biscotti, Pumpkin Spice Latte, Pumpkin Bundt Cake, Pumpkin Whoopie Pies with Maple Cream Cheese Frosting, Pumpkin Chocolate Chip Muffins, Pumpkin Pie and Stuffed Pumpkin Cupcakes. Okay, I went nuts. But I love this seasonal gourd. It's wonderful and spicy and warm and fantastic. And once October September August hits, I start thinking of wonderful ways to use it in every recipe possible. On a lazy Saturday, Julia and I made this recipe, and though it's not the prettiest little thing you ever laid eyes on, it tastes amazingly moist and autumny and I highly recommend it... just maybe not for a party. Julia and I have an issue with cake in the house. Whenever we make it, little kitchen elves come and take bites of the cake all day until it is gone. Solution? Make everything miniature. 1. In a small bowl, combine sugars and cinnamon. Cut in the butter until mixture resembles coarse crumbs. Stir in pecans; set aside. 2. In a mixing bowl, cream butter and sugar. Add eggs, one at a time, beating well after each addition. 3. In yet another bowl, combine the sour cream, pumpkin and vanilla; mix well. 4. In a fourth bowl, combine dry ingredients; add to creamed mixture alternately with sour cream mixture. Beat on low just until blended. 5. Spread the batter into 24 greased muffin tins and sprinkle with topping. Bake at 325 degrees F for 12-15 minutes or until a toothpick inserted near the center comes out clean. Pretty, delicious little cakes... love the flavor! Yup, I can definitely handle these muffins. Even though I love summer and all its fruits, I don't mind moving into pumpkin and apple mode (especially with the "a la" thrown in there). 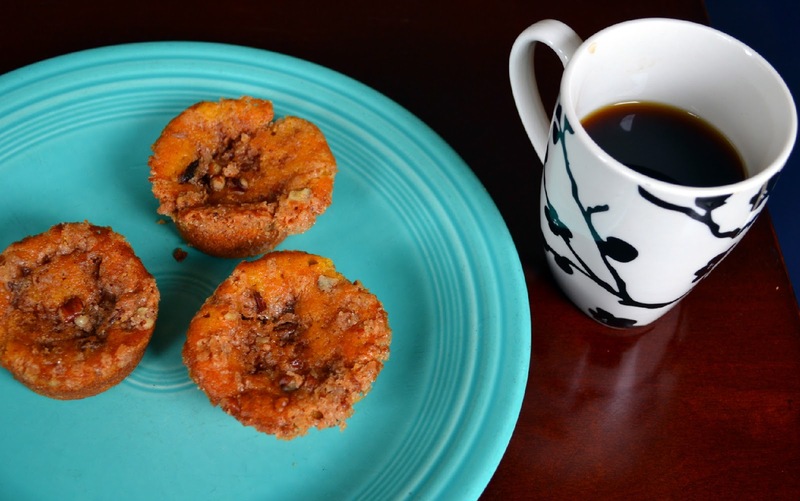 These muffins look delicious...and that pecan crumble topping....wow. These look and sound fantastic. I love coffee cake and it seems even better in a muffin.